Managing an IT organization is a tough and challenging job, but it can be much easier and more rewarding when you have the knowledge and insight in how to do the job effectively. Learning to manage by trial and effort is not only ineffective, it is risky and expensive for your company and can even damage your career. The challenge is there is usually no one around who can help develop an IT manager in a company, , , technology is not the core competency of most companies so the IT manager has to learn the best way he can. This is high risk and most of the time does not work very well. What you need is a set of practical processes and simple tools to help you do what is required to succeed in an IT manager role. Managing an IT organization is like anything else, , , once you know what to do and how to go about it and have the tools to do the job, it becomes second nature, , , just like riding a bicycle, configuring a router, or developing a web page. But if you do not have the experience and know-how, , , managing IT can be a very intimidating challenge with severe consequences. Why is it so hard to become a partner with my senior managers and what do I need to do to become a partner? How do I deal with a difficult client? Why is budgeting so difficult and take me so long to do? How do I develop an IT strategy and get it approved? What are the steps to turn a problem employee around? How do I motivate my staff when I don’t have money to spend? How should I go about prioritizing the work we need to do when we do not have sufficient staff to do the work? Why are my recommendations so hard to get funded and approved? How do you manage client expectations when all they want is everything they request and have it all completed today? Why do my clients not understand or appreciate our IT organization? Why are our IT projects not being completed successfully? Why is communicating to my clients so difficult for me? Are you aware that this is a major issue for over 70% of all IT employees? There are specific reasons why the vast majority of IT people are not good communicators. You may not be aware of what it is but I can guarantee most reading this article find communicating with clients and senior managers to be difficult, intimidating, or at least challenging. The cause is real simple and I’ll show you how to overcome it so you can achieve more success, , , this single issue is the cause of many, many IT manager failures. Learn what it is and how to overcome it and you will achieve much more success. This issue and the others listed above plus others is why I wrote my first ten books we called the IT Manager Development Series, , , to help IT managers of the world achieve more success. These books and the accompanying IT Manager ToolKit we bundled in as a bonus have been tremendously successful with thousands of copies sold around the world over the past ten years. I just completed rewriting these 10 books, , , from top to bottom and from front cover to back cover. They are completely rewritten with new content, new and revised tools, easier to read and even new covers. Ten new books that took hundreds of hours to complete, , , all to give IT managers of the world resources to help you achieve more success. 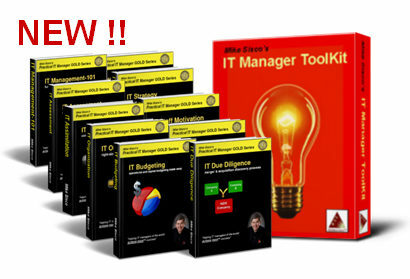 Buyers of the full set also receive a BONUS, , , the IT Manager ToolKit containing over 100 IT manager tools and templates, , , all revised and updated. 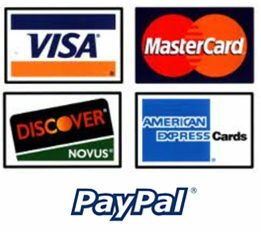 The tools can be used “as is” or customized to meet your specific needs. The information and insight in these books teaches you how to manage the “business” of IT versus the technology, , , you need to be viewed as a “business manager”, not a “technical manager” to achieve real success.. The books show you what to do and how to do things to achieve IT success, and they also explain why certain issues are so difficult for IT managers and IT employees and how to overcome these obstacles. It’s not good enough to explain how to do something, we also need to know why things work or do not work and what causes them to work or not work. When you understand the dynamics of what causes certain things to occur, or not to occur, it makes it much easier to do what is necessary to achieve success. The books are straightforward and down to earth, , , just what you would expect from me if you have read any of my ITLever Blog posts or articles. Practical, simple, and to the point, , , no need to discuss something in 20 pages when you can do it in 1 or 2 pages. IT managers are very busy, , , they need you to get to the point so that’s what I try to do in the books. Start with IT Management-101. You can download this one for free when subscribing to my free Practical IT Manager Newsletter. Go to www.mde.net/free to subscribe. This book is a great foundation and why we make it available for free. Next, read IT Due Diligence. This book gives you a process and all the tools you need to conduct an effective IT assessment, , , the very first thing you should do in a new IT manager responsibility. You have to determine the business needs and issues plus your IT capacity to develop an appropriate IT strategy of the work you should focus on. Next, , , IT Strategy. You have to organize your IT assessment findings into logical and appropriate projects of work, , , and they must be prioritized. This book helps you do just that and gives you a few tools that will help you prioritize your work, communicate your recommendations, and gain approval from senior management. The key to IT credibility is delivering projects successfully, or “doing what you say you will do”. IT Project Management provides everything you need to start delivering your projects successfully, , , even insight as to why they aren’t completed successfully in so many IT organizations around the world. IT Organization would be my next read. Learn how to right-size your organization by determining what you need and what you have. You need an IT organization strategy, , , this book helps you define what it should be. If you manage an organization, you better learn how to motivate people, , , IT Staff Motivation and Development is next. I’ll give you proven techniques that will help you motivate your staff like never before and with no money. IT Budgeting is next on the list unless you are in the midst of your company’s budgeting process or about to go into it, , , if so, you may want to move this up the list of reading. I’ll show you how to simplify budgeting and be confident you create an achievable budget, , , and do it faster and easier than ever before. Budgeting is not difficult if you have insight and tools to make it happen. IT Asset Management, , , not one of my favorite topics to write about but a necessary focus to manage your IT organization successfully. One of the tools I give you in this one can help create your IT credibility, , , it may be my very best tool in what it has done for my career. IT Assimilation focuses on the transition activities after completing an IT assessment or company acquisition. You can read this one near the end or right after IT Due Diligence. 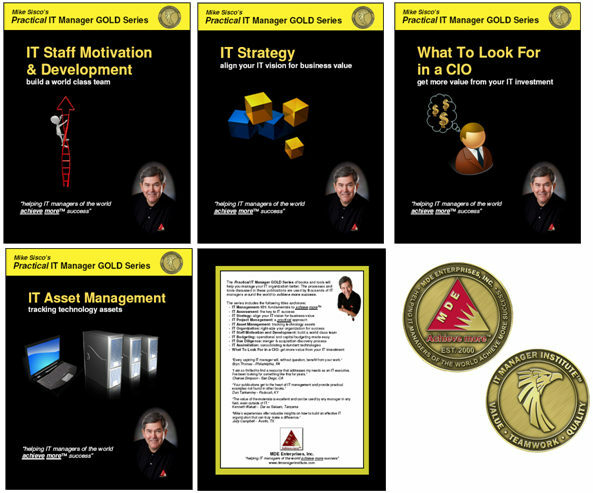 The last book is the very first book I wrote, What To Look For in a CIO. Written for executives who are interested in the success of their IT organization, it explains the differences in IT manager types and provides a process to help you define what you need in order to attain more value from your IT investment. 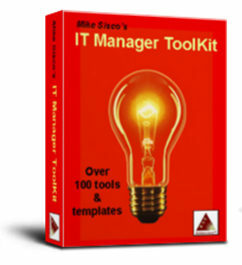 Finally, review the INDEX file in the IT Manager ToolKit to see what’s in it, , , ,there are dozens of additional IT management tools not discussed in these ten books. Save $195.00 by buying the bundle! You will pay $474.50 if you purchase the books and ToolKit separately. Purchase our best selling bundle like thousands of IT managers have and save! It is one of our BEST VALUES. BONUS – Order by November 30th, 2011 and we will send you a special Executive Report (a $150.00 value) that will give you insight into what makes IT employees tick, , , something every IT manager needs to be aware of. 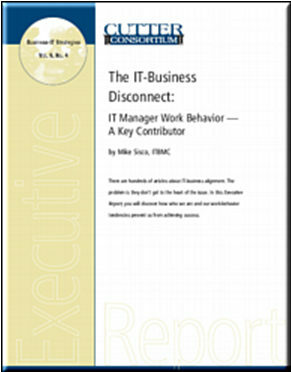 Take the quick survey in this report and see if your work behavior is similar to most IT managers and their employees. There are very real reasons why our type of personality is drawn to technology. As technicians these personality traits help us succeed, , , but as IT managers these same traits can cause you to struggle with many things and even fail in your new position. Learn why. The books will be highlighted and sold at itmanagerinstitute.com. We are overhauling our entire infrastructure so don’t be surprised if you see a bit of “work in progress” for a while. That’s right a complete overhaul of our entire infrastructure , , , equipment, web sites, shopping cart and order fulfillment, plus a few very exciting features to support our company strategy that you will begin seeing in the weeks ahead. Additional titles, new tools, and more training are planned and will be released in the months to come once we have the new infrastructure in place. 2012 is going to be our best year yet! 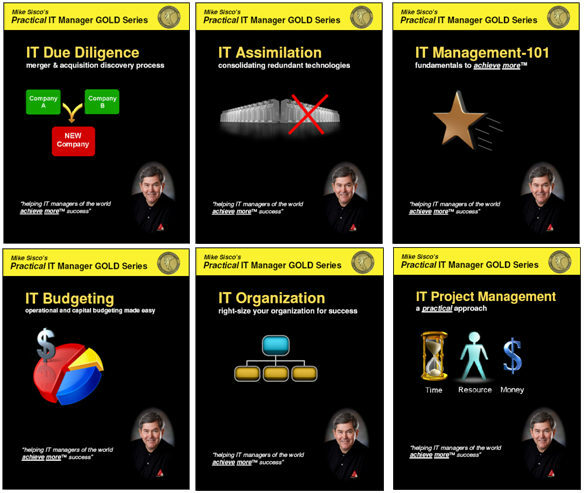 This entry was posted in IT Manager Tools and tagged ict manager, information systems, is manager, it manager books, it manager how to, it manager tools, it manager training, it tools and templates, mis manager, Practical IT Manager GOLD Series. Bookmark the permalink.